The Twin Falls are two winding waterfalls located in the picturesque Mt Aspiring National Park, a short drive from Wanaka. Most visitors just see them from the road, but you can get up close to them on this half-day climb that’s suitable for beginners and experts alike. See the National Park from a new perspective and take a dip in hidden pools you find during the climb. What to bring: sunglasses, sun protection (hat and sun block) , sturdy close-toed walking shoes, something to swim in, a small towel (optional ) small backpack, camera (optional), comfortable trekking clothes suitable for weather on the day. Minimum age on this tour is 12 years. 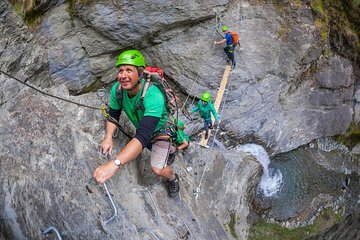 If you are under 16, you must climb our via ferrata with an adult guardian. For children under 12 a private tour may be an option. Please request upon booking. All minors (16 years and under) require an adult guardian’s signature on their waiver. There are no upper age limits to this activity.